At MakLoc Buildings Inc. we are continuously searching for innovative ways to service our customers better. Our goal is to provide our customers with turnkey solutions for all their metal building needs at an affordable price, while maintaining the highest commitment to the safety of our employees and the quality of our products. The MakLoc Read More.. Complacency is perhaps one of the biggest problems we face in completing our day to day tasks. We are used to things being a certain way each time and unless the obvious comes right out and hits us, we can be oblivious to it all. This is state of mind can affect many things such Read More.. Structural Steel Fabrication and Welding of Metal Buildings by Qualified and Ticketed Tradespeople! Beginning in July of 2004 MakLoc Buildings Inc. has been a CSA W47.1 Div.2 certified company and as such MakLoc’s Weld Shop has recently received stamped approvals for their Welding Procedure Specification (WPS) and Welding Procedure Data Sheets (WPDS) from the Canadian Welding Bureau (CWB) to utilize the Flux Cored Arc Welding (FCAW) process to Read More..
MakLoc Buildings Inc. uses their ingenuity and innovation to continually exceed customers’ expectations. 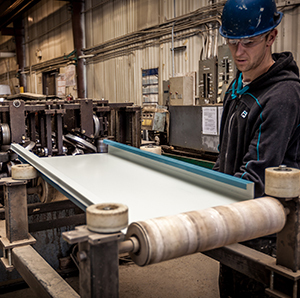 With over 45 years of industry-leading production of structural steel buildings, MakLoc does whatever is required to get the job done. Boasting a broad client base in various industries that extend beyond Canada’s borders, MakLoc has engrained versatility and quality into every Read More.. Through a relationship with MakLoc Construction Inc., MakLoc Buildings is an authorized distributor of Varco Pruden and American Buildings pre-engineered building products, in addition to providing its own brand of metal building solutions. To better highlight this form of construction, the Metal Building Manufacturers Association (MBMA) has released a video featuring the engineering and manufacturing Read More..
MakLoc Buildings Inc. recently completed an external safety audit, a requirement of the Alberta Construction Safety Association (ACS) every three years. Congratulations to everyone involved helping MakLoc achieve a mark of 92%, above the average for companies of this size. Maintaining our COR is a minimum requirement to be able to quote and work on Read More..
MakLoc Buildings Document Control department has recently created a customized Document Control and Management Program called DocCAMS. The first phase of the program was rolled out in September, and is in full operation now. This phase of the program is responsible for tracking all of the documentation submitted and pending approval to our clients. The Read More..
MakLoc Buildings Inc. was recently selected as a regional finalist for Canada’s Best Managed Companies and received a certificate of recognition at the Awards Gala at the Hotel MacDonald in Edmonton on Wednesday, November 16, 2016. Judging at the national level will occur early in 2017, with final awards presentation held in Toronto in April. Read More..
MakLoc Buildings puts safety first in all it’s departments, and at our September Safety Meeting we discussed the importance of safe driving for all our employees. Whether it’s a company vehicle driving to site, a bobcat or forklift moving about the yard, or your personal vehicle going to and from the office, safe driving habits Read More..